Before your can create your digital masterpiece you almost always have to make a sketch. There are as many ways to go about sketching as there are artists, but from the replies to some of my previous tutorials there seems to be an interest to see it done in more detail. This tutorial does not only help you get down to sketching. Pencil drawings are pieces of art all in themselves. Making black & white pencil drawings are both fun and educational, since you can focus on things like anatomy and shadow and won't get distracted by icky things like colour. Making pencil drawings -- be it on the computer or on paper -- is a great and reliable way to improve your artistic talent. Many artists -- also those with drawing tablets -- prefer sketching on a paper first, then scan the sketch into the computer and continue from there. I prefer doing the whole thing in GIMP, but many bits of this tutorial are interesting also for those preferring to scan. You will want to have GIMP setup with resizable brushes -- this means you will be able to resize your brush gradually with a keystroke. So if you haven't already, go do that now. My [Setting up GIMP for artistic work] tutorial tells you how to do. If you are working with a mouse, you might consider doing that tutorial fully, to train up your use of the mouse as a drawing tool. The mouse takes practice before you can use it to draw freehand. To follow this tutorial you need to download a set of brushes that mimics pencils and crayons. DeviantArt user "wflu" has a set of animated brushes that I have used for this tutorial (for some reason they are called "crayons")-- [link] Consider faving them and/or comment on his page if you download and use these brushes. There are many more brushes to be found on DeviantArt, you might want to make a search for "GIMP brushes" to see if you find something you like. If you don't know how to get your downloaded brushes recognized by GIMP, you should refer to the relevant section of the [Beginning GIMP] tutorial. In this tutorial we will be using two GIMP tools only -- the brush and the eraser. To retain that pencil feel we won't do any smudging or blurring at all (so no airbrushing either). We will use the hard-edged resizable round brush you should have created if you followed the Airbrushing tutorial above, and we will use the newly downloaded special "crayon" brushes. Note that the eraser is a powerful drawing tool in its own right. It can be used with any brush, and creates negative space in your image. We will use the eraser a lot, so if you haven't thought of it as a real drawing tool, it's time to start doing that. 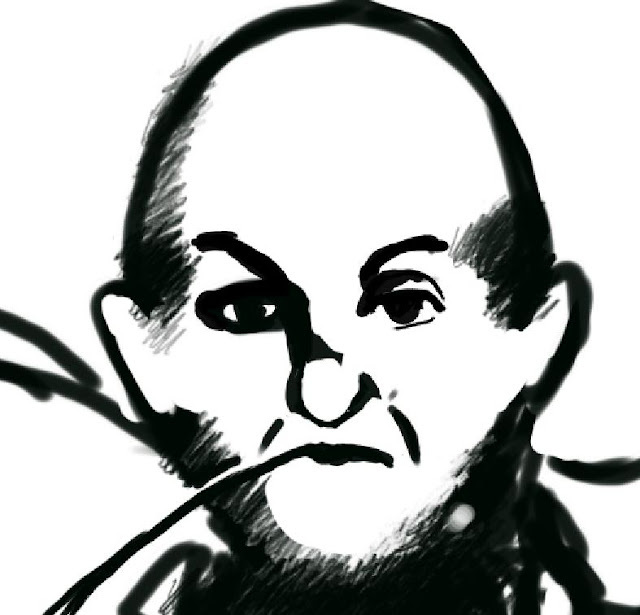 Set the brush and eraser tools to 100% opacity. If you use a drawing tablet, set your eraser to have pressure-sensitive opacity, size and hardness. You might consider doing the same with your brush tool, if you know what you're doing. A Concept sketch, which is what we will create here, is a quick image you do to explore an idea you have, show off your ideas to others and similar. 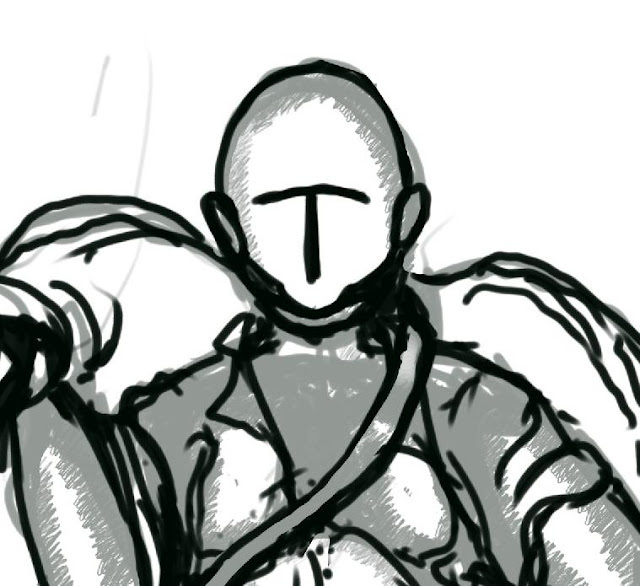 It can be the first rough idea for a new character in a comic or a computer game for example. The "sketch" bit is a misnomer, a concept sketch can be as impressive-looking as you want. It needs not be black&white either. First you need an idea though, an concept for your drawing. I cannot help you with this part, this is where your imagination comes in. 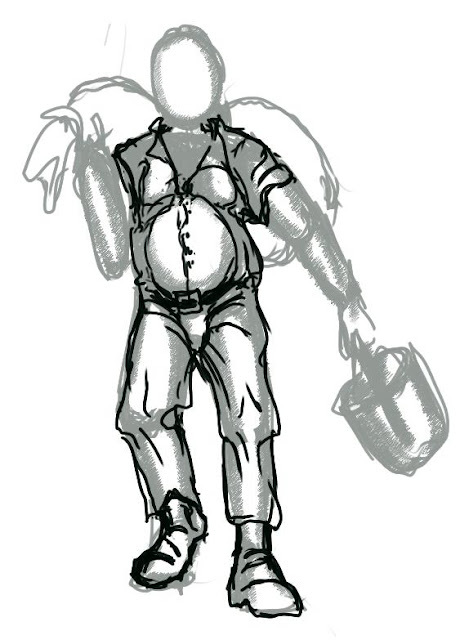 For the sake of this tutorial I will draw a "farmer" character. It's rather sketchy in my mind at this point, but I'm imagining a rugged and grumpy character, heavy-set, with a beer belly... Ok, let's go with that. This is my GIMP setup. These images were taken using GIMP 2.2.13 under Linux Debian, but even though later versions of GIMP might look a bit different this tutorial should work the same way. Create the image to be an A4 at 300 DPI (2480x3508 pixels) You need it to be at least this big, not only for the sake of possbly printing in the future, but also because those crayon brushes are rather big and you'll want as much screen estate as you can for moving them around small surfaces later. The first thing you should do is to create a new, transparent layer. Name it "sketch" and work on it from now on. You can sketch whatever idea you want, but for the sake of this tutorial, I will assume you'll be trying to replicate my image. Zoom out far enough so that you see the entire canvas. The worst you can do is to start looking at a single small area at this point. You want to look at the entire picture. Zoom out, then use your resizable brush to make the brush large enough to see. This means your lines will be thick and it will look like crap if you zoom in -- so what? Details will come later, much later. 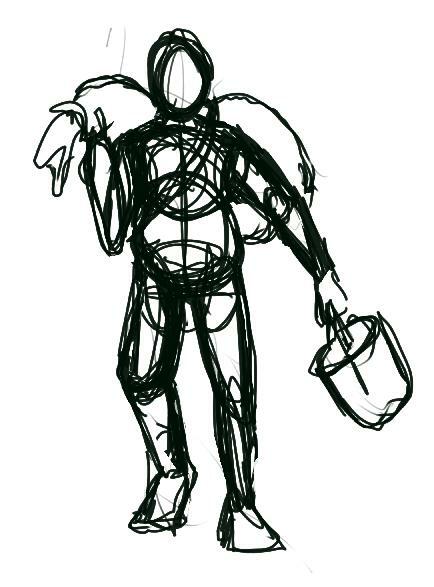 For the Farmer character we'll be doing, I decide that a front-on view would be nice, so I lay out the most simple of stick figures to play around with the pose. As you can see, not much effort has gone into making the stick figure look like the human skeleton it formally represents. 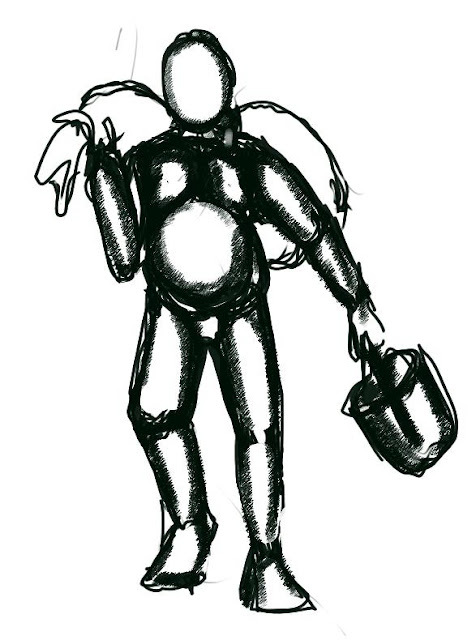 The stick figure's spine sets the overall pose of the character. This and the following two sketching steps are the most important steps of the whole image process, because this is where you can experiment and correct everything most easily. 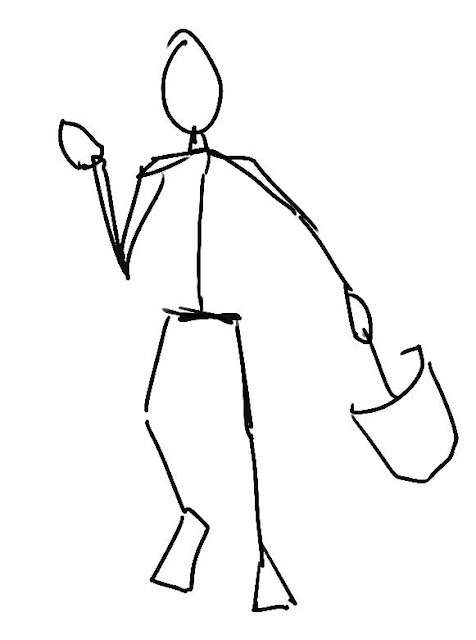 Keep the stick figure just as simple as the one here (use blocks and ovals for hands and feet for example). With such a simple image you need not be annoyed about deleting your mistakes -- it's so quick to draw a better one! I even deleted the whole thing a few times and started over from scratch until I found a pose I liked. Zoom out now and then (or step away from your monitor) to make sure the pose looks ok at a distance. Looking at such a simple image, most people have a sort of intuitive feeling for if the proportions are correct. You can also experiment with very complex poses this way. Nevertheless, knowledge of anatomy is important, so you might want to look up a reference book on human anatomy at some point. For now, just try to mimic my proportions if you are unsure. Don't be afraid to spend some time at this stage. If your pose looks weird it will be much harder to correct it later. 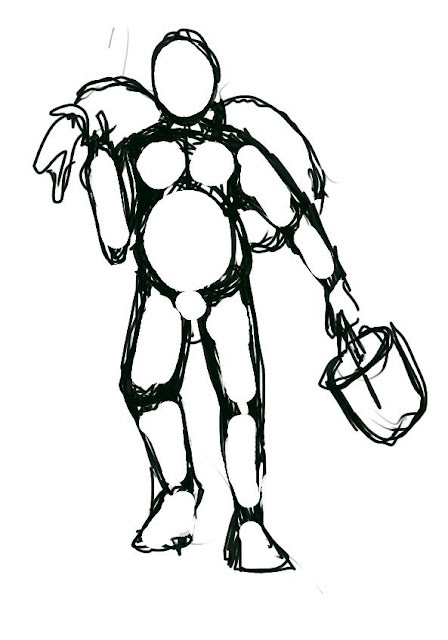 Now we start fleshing out the simple stick figure. Basic procedure is to still keep it as simple as possible. Let all appendices be simple tubes and all joints be spheres. Tubes makes it simple to see the 3-D behaviour of limbs, something that was harder with the skeleton. For example it can be very hard to imagine how short an arm should look if it was pointed directly away from us. It is a lot easier to imagine the perspective of a tube than to try to draw e.g. a full-fledged hand in perspective from scratch, so use your chance here to experiment. Don't be afraid to re-evaluate your pose at this stage, it's still easy to redo parts or all of your drawing. I usually start with the hips -- I draw something that looks like a bikini-bottom for the crotch and place spheres in the "bikini's" leg openings to create the hip joints. This is a particularily useful trick for drawing females, because making the spheres a bit bigger will help a lot to create a very feminine-looking hip section. 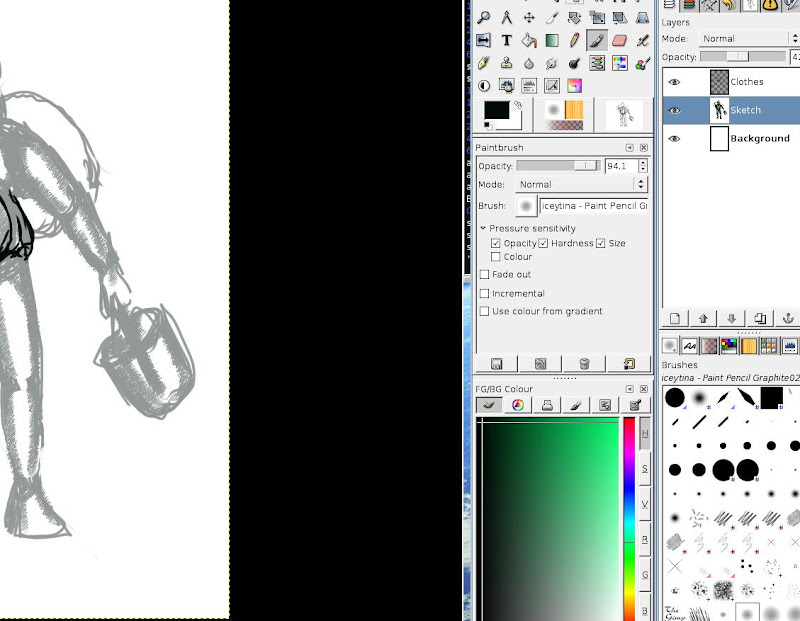 Now we're drawing a man though, so the hips are less pronounced. Onto the legs. As said, all limbs are represented as "tubes" linked together by the joints (represented by spheres) Follow the skeleton we did before and extend "tubes"for the thighs. Make a new set of spheres for the knees. In the image I have already given the tubes some "realistic" shape, but you don't have to do that yet -- in fact you shouldn't if you want to learn to use this technique properly. Draw boring straight unrealistic tubes. Also the feet have spheres for joints (I didn't draw them in my sketch, sorry) and the feet are square or triangular blocks at this stage. I wanted a heavy-set man, so I fit a large sphere to represent his belly. Two other spheres make out his upper torso. 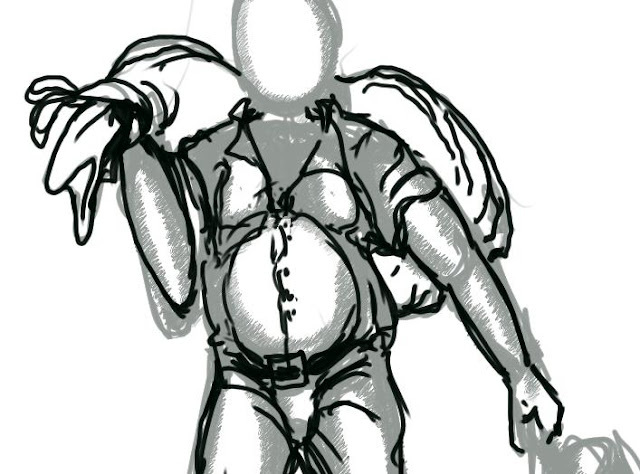 Another way of drawing the torso (when the belly is not so dominating) is to draw it with a ball for the belly (fitting into the hips), and imagine mounting a vest on top of that for the torso. The shoulders are then new spheres in the arm sockets of that vest. Arms are tubes linked by spheres making out the elbows. The head sits on top of a short tube (the neck), but I expect that the neck will not show much later for this character -- he's more of the type that has the head directly on his shoulders. I have used a more casual tube construction in this image -- you shouldn't be as casual in making the joints as I did though, try to place the joints as spheres in the right places, for practice if nothing else. Remember, keeping it at simple tubes and spheres makes it much easier to test out complex anatomical poses. Still working with the round, hard resizable brush, try to give some "weight" to your character. Now we move away from the tubes and spheres and try to make them more realistic. Flesh out the tubes you drew into actually looking like real muscles. Arms and legs taper into more narrow forms near hands and feet. Try to dress skin on top of your tubes to make smooth transitions and forms. 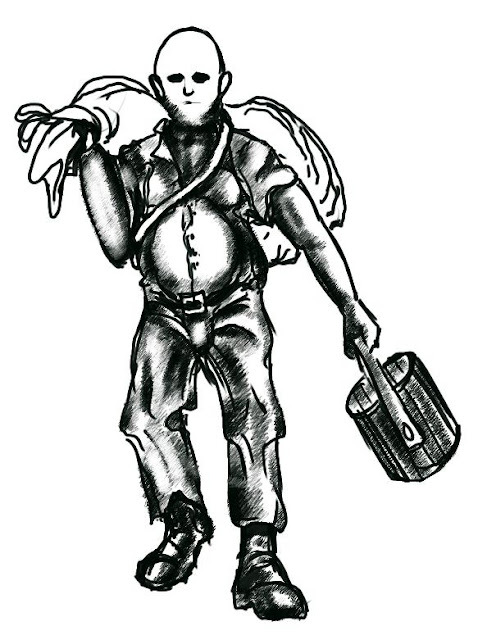 In this image we also add the heavy sack over the farmer's back, as well as outline the bucket a little more. In principle, the previous image works fine for a first rough. But let's clean it up a bit so it's easier to see it's 3-D form. 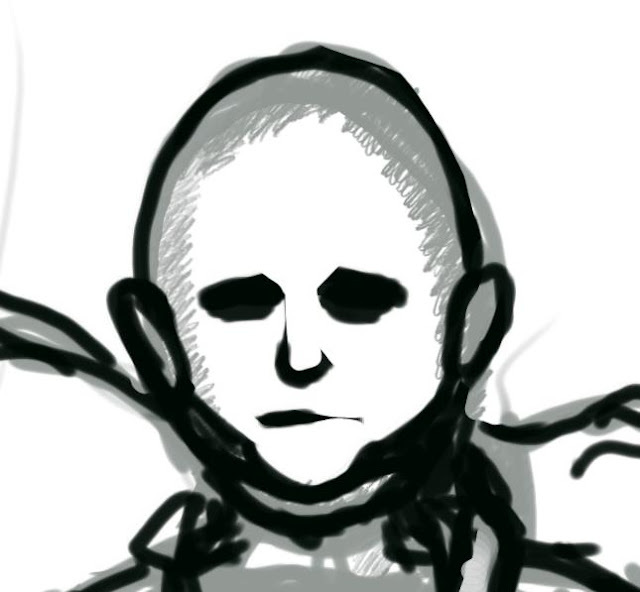 Bring forth your eraser and remove all the lines that where "behind" or "inside" the character. This image shows how it looks directly after having used the eraser. As you can see, all major "forms" of the character can be made out. Understanding the 3D-form of the character is essential when we try to put clothes on him later. This is in essence a naked character, albeit a simplified such. A little side-track: Try out your newly downloaded "Crayon" animated brushes to shade your sketch. 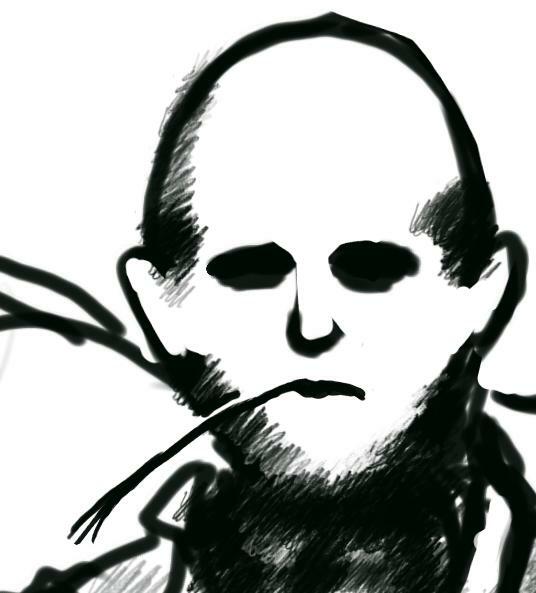 What this brush do is mimick a form of "cross-hatching", and it creates something that looks quite "pencilled" indeed. It's really fun to play around with! Note-- the main point here is to enhance the 3-D form of the character. If you fill with too much black, erase it with the same "Crayon" brush, this will make the erasing less sharp. In the end you should end up with something like in my picture. This is the last time we will draw on this this sketch layer. In the future it will be used to show the form of the character's body and allow clothes to be put on it, then it can be deleted. 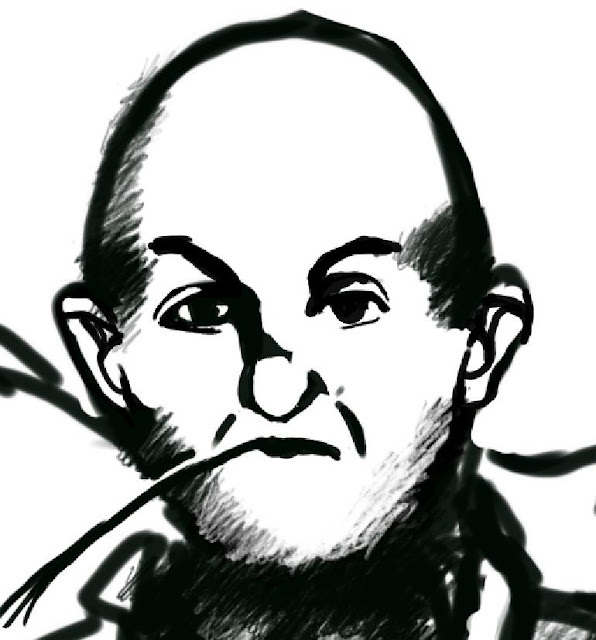 Lower the opacity of your sketch layer to 40% or so. Create a new layer named "Clothes". Work on this layer from now on. On the "Clothes" layer we now start drawing the clothes. For this we use the resizable round brush. For the farmer, I'm picturing a loose shirt with pulled-up arms and baggy pants. His round stomach stretches the shirt. For placing folds, draw them away from joints. Especially around the crotch, there are a lot of wrinkles. 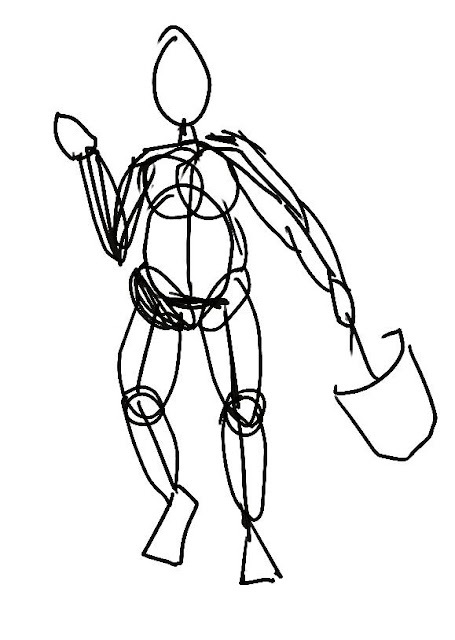 Use the underlying sketch to see the "topology" of the body below the clothes. Continue with the exposed skin -- the arms. Note how I've adjusted the right arm here compared to the sketch -- despite all sketching, you must be ready to adjust something that looks wrong -- do so as soon as you can, it will only get harder to fix it the longer you wait. Also made the outline of the sack. Note the lines of the sack -- a sack full of small items or maybe grain will cause structure like this when seen from the side..
To hold up the sack he needs to have a sash across his chest. Use the eraser to make room for the sash, mark the edges with the round brush. The face represents a whole set of problems on its own and there are many ways to approach it. I went with a rather round head-shape to fit the body. I imagine there will be double-chins too. Make a "T-mark" to place the root of the nose and the eyes. You can use this "T" to orient the face if you want to have it look in a different directions. It also helps when placing the ears, which you can do now (to know the height of the ears, remember how a pair of glasses are put on). Take your eraser and delete down the center of the "T" you did. This is the back of the nose. Make some black splotches at the base of what remains of the T, to outline the tip of the nose. Enlarge the upper "wings" of the T downwards to make the eye sockets. Don't make any more detailed eyes than that now. Think of it as the eyes being hidden in pools of darkness for now. At this stage we're happy just to know the location of the eyes. We will improve them in the future. Place the mouth as a line. Make sure there is enough room below the mouth to hold the chin. If there's not enough room, you placed your T too far down on the face. Redo -- redrawing a T is simple enough! Hide the sketch layer and you should have a clean drawing you can expand on. Turn the sketch layer on and off a few times if you missed something (like filling in the bucket), but when you're done you can turn off the sketch layer forever or even delete it outright. Now to make this into a shaded pencil drawing. Get the animated "Crayon" brush and start shading the exposed skin. Remember that you are only working with black -- not any grays. The only way you have to make a shading "light" is to have the black lines cross each other less densely there. So use the eraser with that same brush to lighten parts of the drawing strategically. 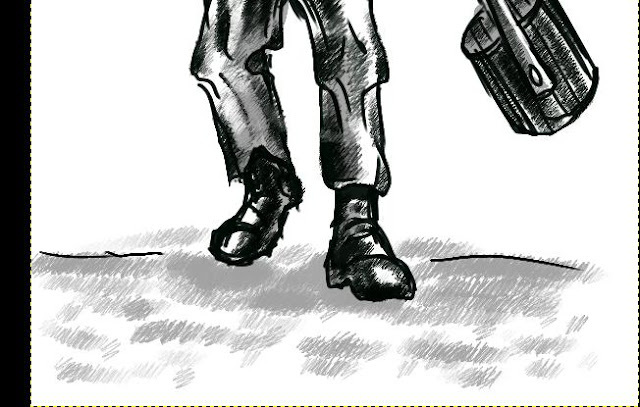 Don't go overboard with the blacks; let the white parts of the image "work" for you. Also, wait with the face and the sack for now. 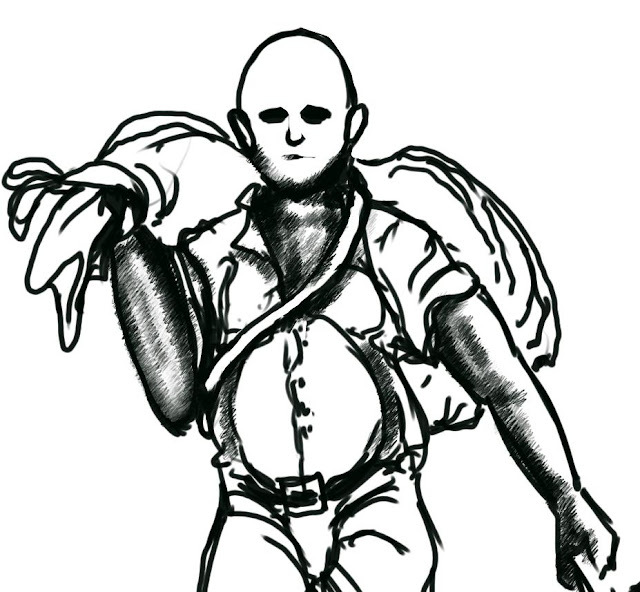 Work over the entire image (except the face and the sack), to establish the form of the character. In this image ther is no clear light source; You want to enhance the features of the character, make contrasts as big as possible while retaining he nice pencil structure you get from the "Crayon" brush. Here you'll notice the brushes are a bit too big to fit in small folds and wrinkles. You might have to resort to the rescalable round brush in some places. Otherwise, remember to use the eraser creatively. So, let's get back to the face. 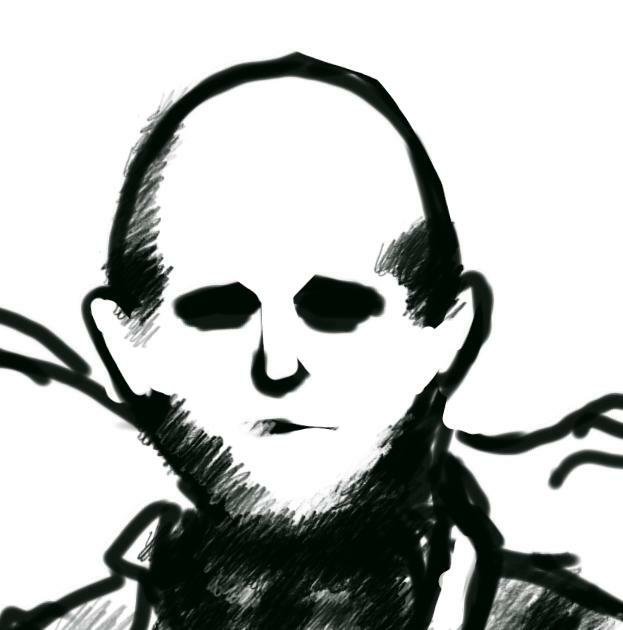 I decided to let the farmer be bald, with just some hair at his temples. That mouth I did looks like he has something sticking out of it, so I decided to let him chew on something. First I drew a pipe, but eventually I decided a straw of grass fit better. Note how the eraser is used to remove the background to enhance the straw. Even though things have been removed, the eye is fooled into thinking the straw now has an outline. Here the nose has been improved with a few black lines. he has also received a few lines around his mouth to indicate some age. Note the heavy shadow to the left of the nose. This implies light comes from the right, which we haven't really established before. But for this image it works. I wanted to go with a grumpy look. Start from the "pools of darkness" you had for his eyes, and use your eraser (with the resizable round brush) to create the whites of the eye. Cut away most of the lower part of the black blob, add a lower eyelid and upper eyelid as well as a strong eyebrow. ... and fixed at this point. More shadow is allowed to remain for this eye because it's shadowed by the nose. This eye can be created exclusively with the eraser. So far we have only worked with black (and white, in the form of the eraser). We have a problem however, with the sack hanging over the farmer's back. If we start shading it with the crayon brush it will be hard to see where the farmer ends and the sack begins. We could leave the sack white, but that doesn't look very good either. 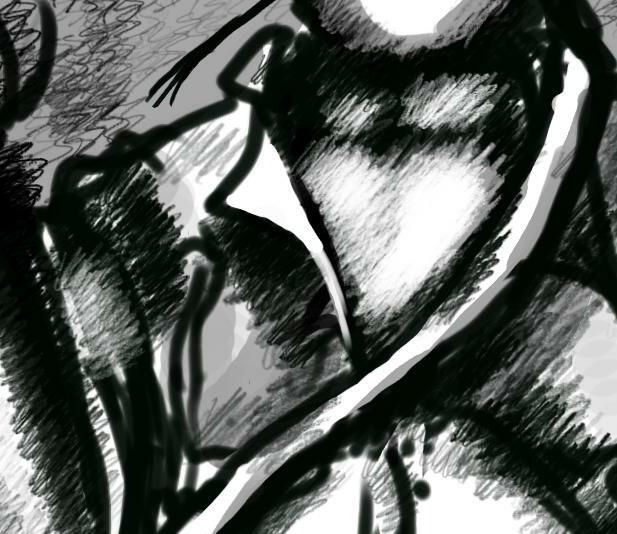 So we will introduce some extra bling to the image in the form of a grey shadow. Create a new layer, name it "Shadow" and set its mode to "Multiply". Multiply mode works excellently for colouring black line drawings, since the black lines will be untouched by colour in the multiply layer. Pick a dark grey (only one, no need for more), and the hard-edged resizable brush. Fill the entire sack uniformly with grey. Use the gray shadow layer to enhance other parts of the image if you think contrast needs to be enhanced. At this stage we need to make the final adjustments to the image. Flip between the "Shadow" layer and the "Outline", adding some small splothses of grey, or erasing/adding to the pencil drawing respectively. Remember to keep tabs on what layer you are on. In the image above, I have erased some black in the fold of the skirt to make it come forward, and also added some grey as a shadow below it, to make it stand out even more. Next I will erase the stray lines on the sash. The entire image is cleaned up this way. This is when you add those little details we ignored before, like buttons, belt buckle and erasing stray lines. I also put a faint shadow on the sack (so it has both a grey shade and black line shading) using another of the Crayon set brushes (The "Crayon Thin" brush to be precise). For a character concept image like this we don't care so much about background. But it's nice to have some ground under his feet. We use the Shadow layer to put down some ground structure. As seen the Crayon brush makes a decent grass impression too. 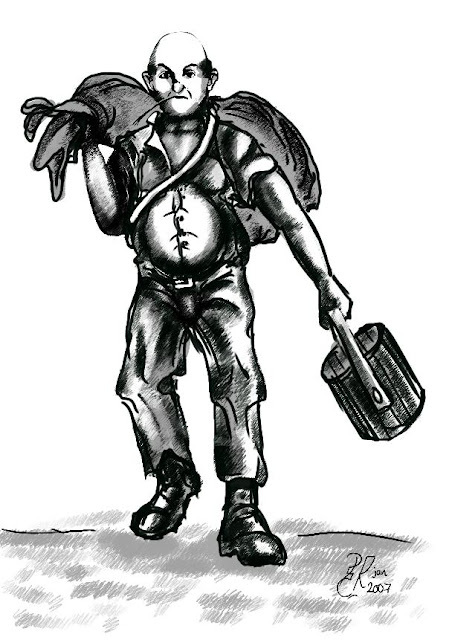 This black&white image is enough to use as a reference if I planned to use this character for something. 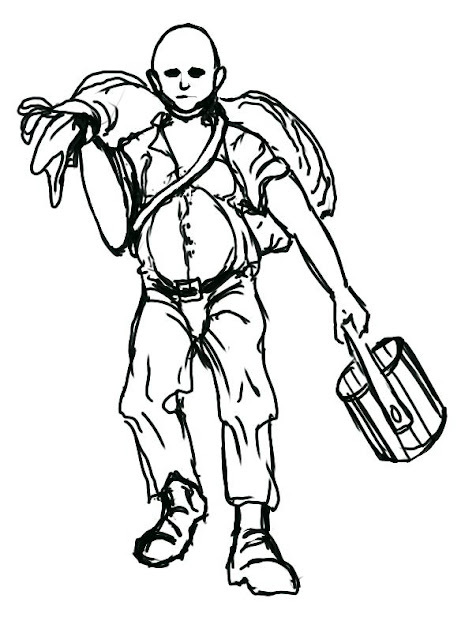 I could look at it if I wanted a farmer walk by in a comic for example (or maybe the farmer is the main character?). I could add a nice background to it to make it more complete. If I didn't want to stick with black&white, I could use it as a reference for a full-fledged colour image. And most importantly, I could easily try out a few different "Farmer characters" to see if one of them works better for whatever I wanted to use them for. I hope this was useful to anyone and that some will try this out.